The Cyclones are committed to player development and fun, and to that end we are proud to announce some exciting programs and events this season. We've partnered with former Blues and Stanley Cup goalie Bruce Racine for goalie development training. Diana Schaefering from Power Play Hockey will be back again this year providing technical hockey skating skills instruction to the girls. NEW this season: Gayle Tucker from Gayle Tucker Power Skating will be working with our teams periodically throughout the year working on Skating skills. NEW this Season: Scott Brandes from End to End hockey will be working with teams on special skill instruction. NEW this season: We've partnered with the ACHA D1 Lindenwood Lady Lynx for development sessions. These are great opportunities for the girls to get exposed to elite players and coaches in the sport and learn from them in a fun environment. Kat Hannah enters her third season as the head coach for the Lindenwood Lady Lynx ice hockey team. She has led her team to Nationals the last two seasons. At the conclusion of the 2015-16 season, Coach Hannah collected her first ACHA Coach of the Year award. She was also invited out to be an assistant coach at the USA Hockey Girls’ Multi-District Player Development/Evaluation Camp in Colorado Springs, Colorado. 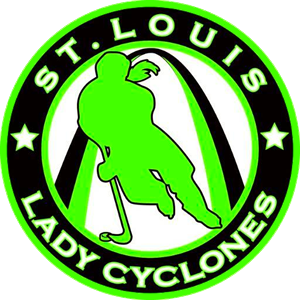 We are looking forward to building a fun and rewarding relationship with this Local Women's Hockey Team. The club will also be heavily involved with the St. Louis Blues organization again this year. All 6U and 8U teams will have the opportunity to participate in the “Little All Stars” program where the teams play a fun game between periods at the Blues Games. We will have “Rink of Dreams” games for all 10U -19U teams. This is where the teams play on Scottrade Center Ice with all of the Bells and Whistles of a real NHL game. These will happen before selected St. Louis Blues home games. Teams will also participate in the “Heartland of Hockey” where the teams go out on the ice before the games for the national anthem. Again this season we'll be able to field multiple teams at each age level, which will allow for better development for your daughter in this awesome sport.